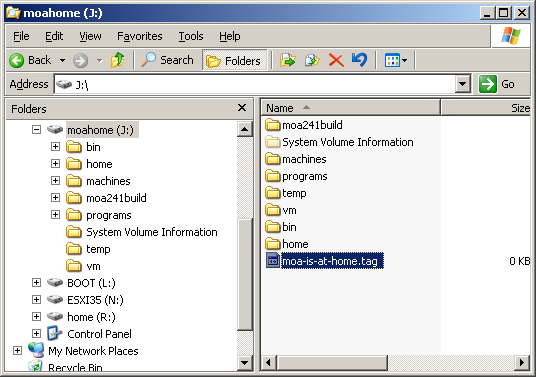 For demonstration at a VMware meeting I of course want all the VMware related bells and whistles that MOA can do. and additionally - still experimental - run WS 7 running on top of PE 3 - 64 bit mode. It starts with a fresh new Western Digital USB disk with a capacity of 250 Gb - such a device is available for 60 Euros or cheaper. 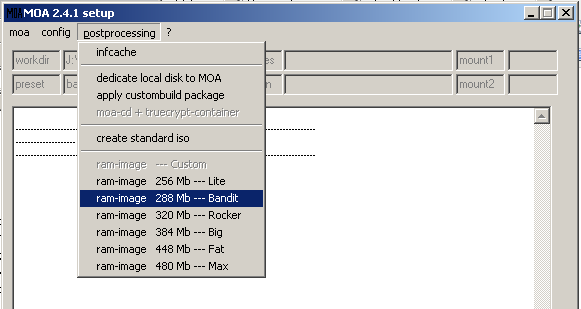 I recommend to do the partitioning on XP or 2003 - so the new disk looks like this in diskmanagement. Next I delete the existing partitions and create 7 new ones. I start by creating three primary ones - then one extended that covers the rest of the free space. Once the extended one is created I continue with logical partitions inside the extended one. # type size filesystem used for ..
At this time it is not necessary to format the Linux - partitions so just leave them unformatted. for convenience sake here is a list of the files that must be downloaded. partition number instead of a driveletter. 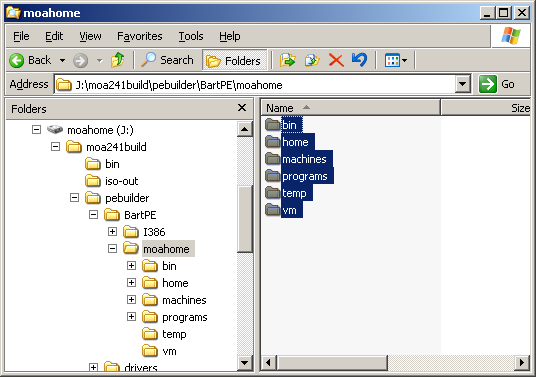 open partition 7 with explorer and create a directory "moa241build" in the root of the empty drive. click "I agree" and then launch "create moa core" from the menu. 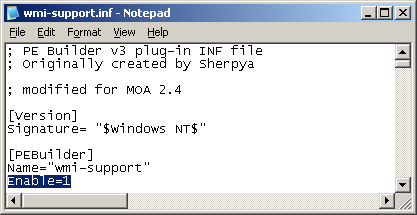 For this example we want all the bells and whistles so we add WMI-support. and set Enable=1 - save the file. 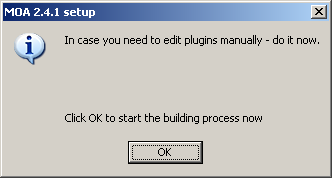 Now click"OK" and let Pebuilder do its job. When Pebuilder is done a last question pops up. Probably you want to say "Yes" here - but you can also add Converter at any later time. So don't worry if the extraction of Converter fails at this moment. When you see the next screen the build is finished. and paste those directories in the root of the partition. 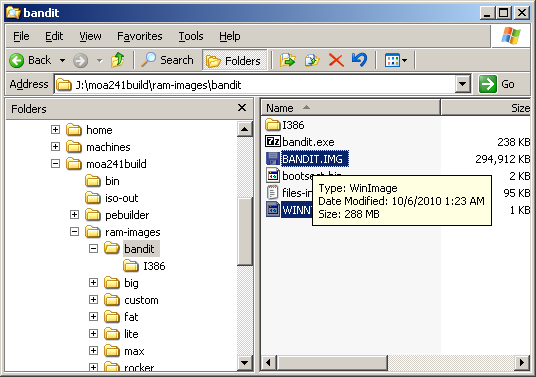 Finally create a tag file named "moa-is-at-home.tag"
and copy the files BANDIT.IMG and WINNT.SIF to the root of partition1. 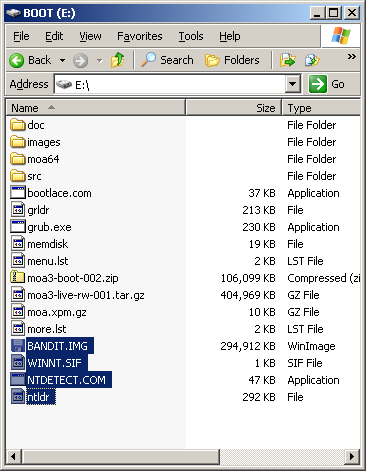 "SETUPLDR.BIN" and "NTDETECT.COM" to the root of partition1. 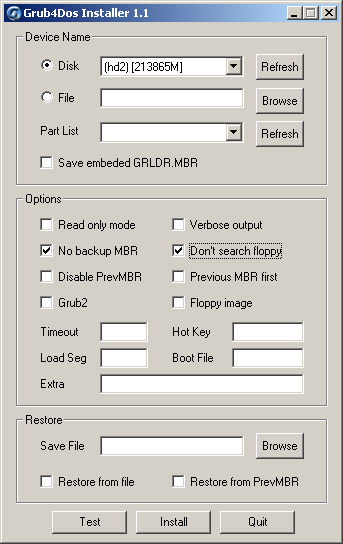 Rename the file "SETUPLDR.BIN" to "ntldr"
Your partition 1 now should look like this. This USB-disk can now be used all by itself. You no longer need the building host. 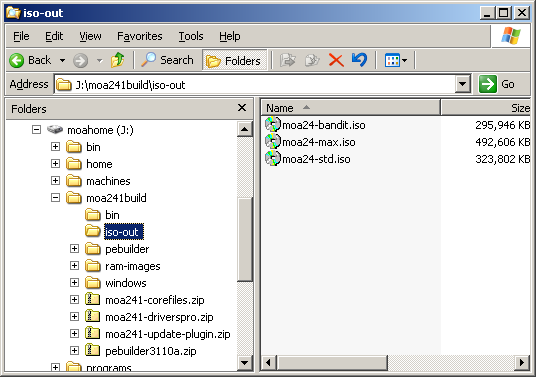 All further customisations are done with MOA itself.